This has been all around the internet today, as well as on Sportscenter (obviously), but for those of you who haven’t heard about it, Obama has filmed a little segment for ESPN in which he fills out his bracket. Word on the street is that his final four teams are Louisville, UNC, Pitt, and Memphis. Now, not to get too politcial, but this seems to make sense to me. Obama had the 50-state strategy in his election. This involved campaigning in states that he was thought to have little or no chance of winning. These included Kentucky (Louisville), Tennessee (Memphis), North Carolina (UNC), and the always important Pennsylvania (Pitt). Anyway, my point is that the one 1-seed he left out, Connecticut, was no question a blue state. He doesn’t have to pander for their support. He knows Connecticut has got his back. The same can’t be said for any of the other teams, except maybe Pitt. Maybe. Imagine if he shunned UNC, Louisville, or especially Memphis. People would be up in arms. They would take to the streets and do bad things. So, there is my unsolicited opinion about the bracket, one which you probably won’t find anywhere else, mainly because it pretty much makes no sense, but still! It’s either that or Obama knows something I don’t about the Tourney. 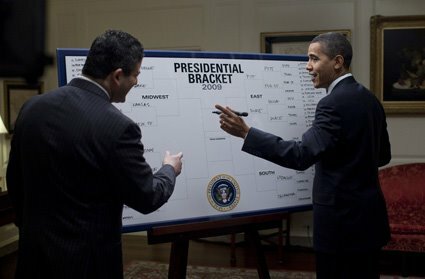 I mean how suspicious would that be if the Tournament turns out JUST like Obama’s bracket. Either way, I’ve got to make some last minute changes to my picks. You are currently browsing the archives for the 50-state strategy category.